You got your Christmas Day outfit sorted? 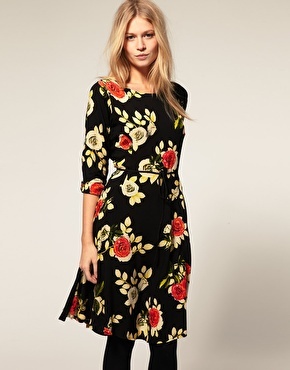 No, me neither, but I've just put in a sneaky order on ASOS, as I've found these fabulous dresses which I think are the perfect Christmas Day option. Knee-length, with sleeves, and none of that dry-clean nonsense, which means those gravy spillages can be dealt with no probs. They are low in stock so get your order in ASAP. These pictures aren't the greatest - use the links and have a look on the website instead. They are the perfect versatile dresses - wearable in winter, with tights, a cardi belted over the top, or even a long-sleeved tee shirt underneath. Footwear options could be heels or boots - both would work, depending on how dressy you want to be. And light enough to wear in summer, with bare legs and a ballet pump. I've blogged on here before about my love of natural fibres, and refusal to buy anything polyester. These dresses are all 100% viscose, but viscose material is a little bit of a mystery to us all. In fact, viscose sits somewhere in between natural fibres and synthetic fibres, and is created from natural cellulose (wood pulp), and produces a fabric that hangs well, washes well and is comfortable to wear. Modal, which you see a lot of in the shops, falls into the same category. I'll let you know how I get on with mine when it arrives in the post - fingers crossed.